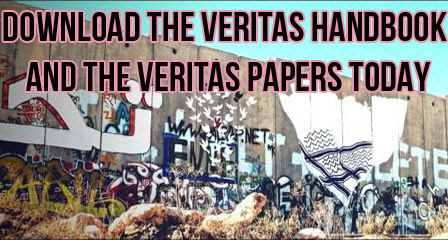 The Veritas Papers: Click Here to Download Now! The Veritas Papers is a set of fifteen pamphlets shedding light on some of the most controversial issues of the occupation. Download them today! The Veritas Team would love to hear your feedback. We would appreciate it if our readers could fill out our small survey and let us know what you would like us to do next! Thank you. 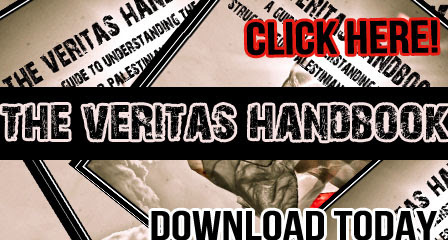 The Veritas Handbook is an extensive handbook containing vital information and resources for anyone and everyone interested in the plight of Palestinians for justice and equality. Back To School Textbook: "The Veritas Handbook"
Back to School Re-Release of "The Veritas Handbook"
This past July, we released the brand new "Veritas Handbook" and got a wonderful reception from all of those dedicated to justice and truth worldwide and now have over 5800 views on our website. 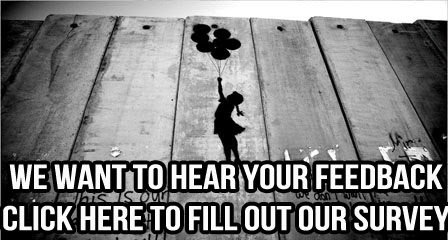 We were featured on a 'concerned' pro-Israel blog, The Electronic Intifada, got a shout-out from the Socialist Worker, and were featured on several sites, including Israel Occupation, the Palestine Freedom Project, the Free Gaza Movement and Islamic Insights- and more! We also created a twitter account (which you should really follow!) and have over 300 fans on our facebook fan page. We got a ton of comments, and released an edited copy of the handbook in August, with more updates to come in the future! Going back to school and university is an exciting event for solidarity activists in each country, as it also means a fresh start to a new year campaigning for justice! Last year was an exciting one for university activists and many landmarks were made in the plight for Palestinian human rights. The Gaza Freedom March took place in the winter, followed by landmark divesting moves by students in California at Berkeley, and UCSD and the full divestment of Evergreen College through a vote from students. Students made the headlines while protesting war criminals Michael Oren and Ehud Olmert, and 11 students were arrested at UC Irvine following the suspension of the MSA for protesting Oren's presence. The year ended off with the massacres on the flotilla, where activists came together united in their plight to end the injustices beseiging the Palestinian people. Needless to say, all of these actions have put the Israel campaign on red-alert as they prepared through the summer and just released a brand new set of resources for pro-Israeli activists- including the "Hasbara Campus Pulse"
This year, it is imperative to work off of the astounding successes of our past year- and more importantly to capitalize on the attention that campus activists are receiving. And fortunately for all of you- we're sure that The Veritas Handbook can help make your year in campus activism more successful and pain-free! The handbook was primarily designed by campus students, for campus students. We know what campus activists need, and have done our best to make sure that the handbook can be useful and handy. We hope that your campus will be able to benefit and use the handbook for the revolution to justice worldwide. Not only that, many campuses will be pleasantly surprised to find their work being featured in the resource sections! Particularly useful for campus activists is the extensive appendix. 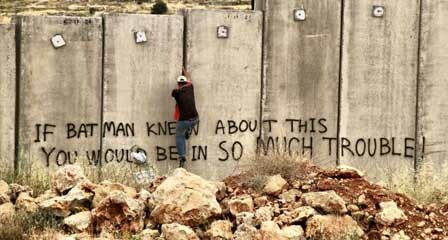 A Concise History of Palestine: Geared towards educating an uninformed audience while solidifying information that any regular activist may have, it has been designed such that it could be a course for activists with a one hour session, once a week, for ten weeks. Commonly Asked Questions: Aimed towards providing activists with factual, comprehensive answers to commonly asked questions. Perspectives and Debates: Contains scholarly and academic insight by some of the most significant thinkers in the field and seeks to inform activists about the important issues surrounding our work and the controversies that arise. These issues, including the interpretations of Israel’s “right to exist,” approaches to confronting the Israeli occupation regime, non-violent and violent resistance, and the varying proposals for a solution to the Zionist-Palestinian conflict, are all addressed from a variety of perspectives. We have not taken a stance on any of these issues, but instead hope to provide you with the resources to make your own decisions. Appendices: Five appendices with a comprehensive resource guide with numerous sources for accurate information, solidarity organizations, links to printable posters and pamphlets, human rights reports, and primary resources and a huge feature on the BDS movement and starting a campaign. We strongly suggest referring back to the primary resources and human rights reports that llie at the heart of understanding the reality of the situation. We have also included significant information not easily accessed, such as details about the Palestinian villages destroyed and depopulated during the 1948 Nakba, a list of Palestinian prisoners (men, women, and children) currently held illegally in Israeli detention, and a list of the children murdered by Israel during Operation Cast Lead. This section is best used virtually as it contains links to many resources, and if you do choose to print the handbook, we suggest that you omit this section. Extended Bibliography: Comprehensive bibliography that can be used as a reading list. We have tried to make the handbook qualitative as opposed to quantitative. Sifting through thousands of resources and materials was an arduous task and although 350 pages may seem endearing, we can assure you that this was after a dire effort to contain the plethora of resources available, choosing the best. Finally, we wish to emphasize once more that our basic premise for the project is to raise awareness about the struggle for Palestinian human rights. This stems from our uncompromising commitment to justice everywhere, and our strong opposition to all forms of racism, oppression, injustice and persecution worldwide. The download of The Veritas Handbok is available here- from several places - completely free of charge! The PDF can be downloaded for free from Google Docs or MediaFire, and can be viewed online through DocStoc or Scribd. If you have any trouble with your downloads, please do not hesitate to contact us. Read The Veritas Handbook on your iPhone, iTouch, or iPad, by downloading the PDF file and transferring it to the Books Application. You can also read The Veritas Handbook on your Kindle by downloading and transferring the PDF file. Due to popular demand and lots of tweeting referencing us- we decided to get Twitter! PRESS RELEASE: The Veritas Handbook- Download Now! July is historically an important month in the struggle for Palestinian human rights. It was in July when the British Empire officially established its control over Palestine through the League of Nations Mandate System (July 24th 1922); it was in July when the first major Zionist terrorist attack against Palestinian civilians occurred (July 26th 1938); it was in July when the International Court of Justice ruled the Apartheid Wall in the West Bank to be illegal in international law (July 9th 2004); and it was also in July when the Palestinian people issued their historic call for boycott, divestment and sanctions (BDS) against Israel (July 9th 2005), which has formed the basis for the global mobilization against Israeli apartheid in recent years. These events may at first appear unrelated, but in fact they are significant historical watersheds marking significant junctures in the nearly century-long struggle for Palestinian human rights. The Veritas Handbook team places great emphasis on understanding the last twelve decades as a totality and viewing it as the necessary context for framing the Palestinian-Zionist conflict. As such, we have provided an essential historical background, in addition to extensive resources, which will provide readers with a fuller understanding of the development and progression of the Palestinian struggle for justice and equality. Appendices: Five appendices with a comprehensive resource guide with numerous sources for accurate information, solidarity organizations, links to printable posters and pamphlets, human rights reports, and primary resources. We strongly suggest referring back to the primary resources and human rights reports that llie at the heart of understanding the reality of the situation. We have also included significant information not easily accessed, such as details about the Palestinian villages destroyed and depopulated during the 1948 Nakba, a list of Palestinian prisoners (men, women, and children) currently held illegally in Israeli detention, and a list of the children murdered by Israel during Operation Cast Lead. This section is best used virtually as it contains links to many resources, and if you do choose to print the handbook, we suggest that you omit this section. Finally, we wish to emphasize once more that our basic premise for the project is to raise awareness about the struggle for Palestinian human rights. This stems from our uncompromising commitment to justice everywhere, and our strong opposition to all forms of racism, oppression, injustice and persecution. As such, by raising awareness about the situation in Palestine, we have aimed to make The Veritas Handbook an important contribution and resource not only beneficial to the struggle for Palestinian human rights, but also a demonstration that the global struggle for justice and equality requires education, action and effort, not merely words or emotions. The Veritas Team's primary aim is to provide attractive and free resources for activists in the Palestine solidarity movement. Our material is freely available for everyone interested in the plight of Palestinians for justice and equality, and as such, all of our publications are available for free PDF downloads. Compiled and written by a multi-ethnic group of former campus activists across North America, The Veritas Team does its level best to provide useful resources for activists. The Veritas Handbook: The handbook contains 347 pages of articles, resources, and debates. The handbook's primary aim is to provide much needed resources to activists and an education that many unfortunately lack. The Veritas Papers: This is a set of fifteen pamphlets in full colour! These aim to be a simple resource for all, and especially activists to distribute to the wider community. They are simple and concise, each requiring only one piece of letter-sized paper. While information is readily available, it is not usually presentable, and this is the primary aim of The Veritas Papers. The Veritas Handbook and Papers have been complimented by friends and foes alike. In fact, the handbook was described by one Israeli advocate as a "compelling presentation, well-designed, and viral". More importantly, the Electronic Intifada described it as "visually and informationally comprehensive for activists, researchers and educators alike". The Veritas Handbook: Sneak Preview! The Veritas Handbook: Sneak Peak! 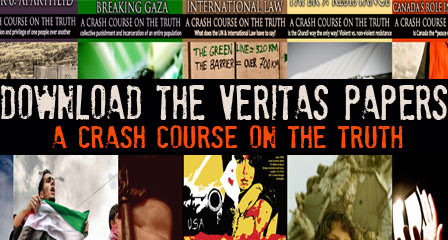 "The Veritas Papers: Makers of 2010 Palestine activist handbook release 15 eye-catching pamphlets"
"New Guide puts Palestine history, debates in activists' hands"
Featured on the following websites, Thank you for supporting us!